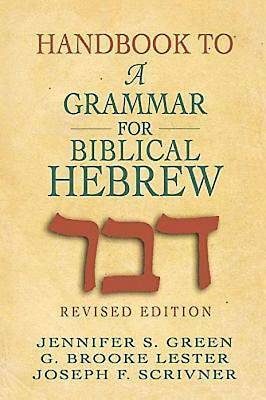 This handbook is a companion to the widely used and standard text, A Grammar for Biblical Hebrew (revised edition), by C. L. Seow. It has been thoroughly and successfully field-tested in various settings for studying biblical Hebrew. For each exercise in the Grammar, this volume refreshes the student on lessons already learned, reinforces explanations and terms used in the lesson, explains concepts not yet covered, provides an annotated answer key, offers practical helps and tips, and cites relevant information in the standard dictionaries and reference grammars. The Handbook helps students make the most of the introductory grammar, in the classroom or for self-guided study. The reference to the major research grammars and lexicons will enable the student and instructor to take learning and teaching to a more advanced level in studying and translating Biblical Hebrew. The authors are doctoral students of C. L. Seow at Princeton Theological Seminary. Jennifer S. Green is an instructor at Columbia Theological Seminary, G. Brooke Lester is an instructor at Seabury-Western Theological Seminary, and Joseph F. Scrivner is an instructor at Samford University.